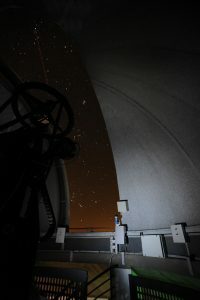 Alt-azimuthal mount 80cm telescope by Astelco, managed for what concerns the scientific activity by the Physics Department (DIFI) of the University of Genova, Italy. The instrument, was fully-characterized with standard stars observations in all the available filters for zero-point determination and extinction coefficient. the second is dedicated to amateurs and set up for several optical oculars. Pointing and position of the secondary mirror are currently controlled using the proprietary AstelOS software, provided by the constructor, on a dedicated Linux machine, while the image data capture is managed by the MaxIm software, running under Windows on a laptop directly connected to the camera. The time stamp is obtained via a GPS antenna device. Further telescope tests allowed to carry out the pointing and tracking accuracy, and a python image reduction pipeline was set up. Echelle spectrograph provided with the telescope with a fiber optic link. Further projects aims at the remotization and robotization of the telescope with the rts2 framework, and the use of cutting-edge websocket-based solutions are under development.